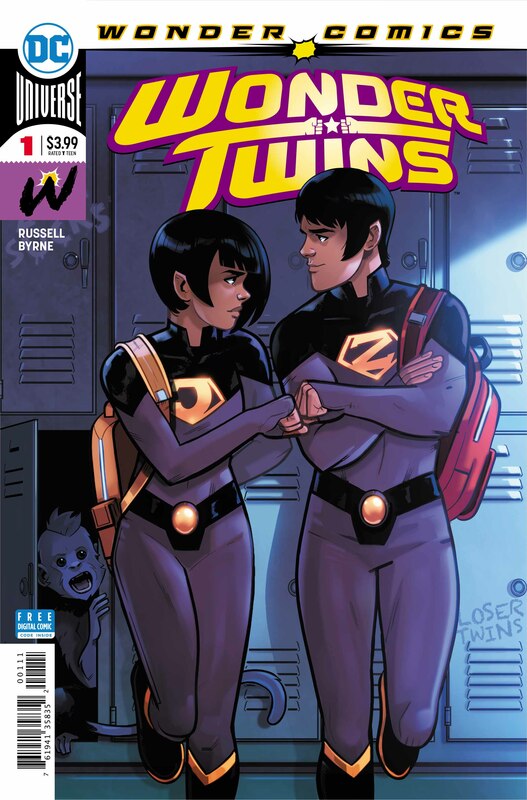 The Wonder Twins are one of DC’s strangest properties that somehow manage to keep enduring. Their oddness has always endeared them to fans, and while their appearances have only been sporadic since debuting on The All-New Super Friends Hour back in 1977, they’ve always managed to maintain a fairly adoring fanbase. And now, Russell and Byrne, two of DC’s most brilliant, are on a mission to prove that Jayna and Zan are as loveable and as relevant as ever in 2019. 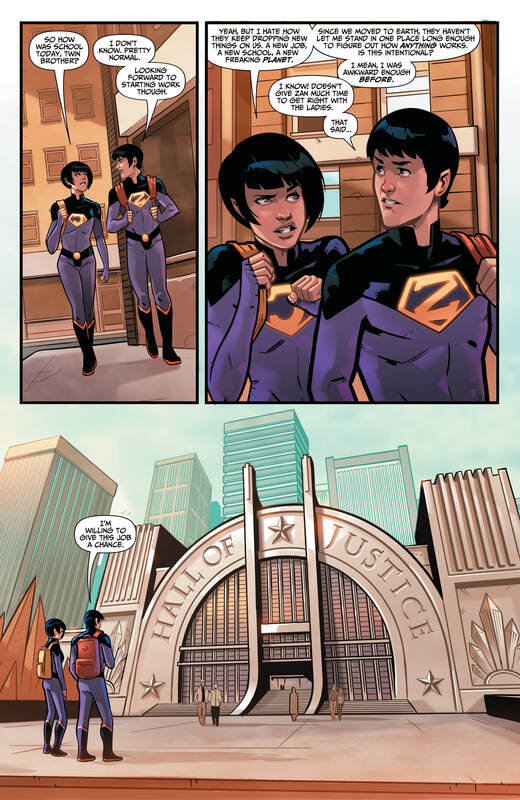 In what must be their first appearance since the New 52, the Wonder Twins are new arrivals on Earth, with a new school and a new job at the Hall of Justice. Together they’re dealing with the differences between their cosmic world and ours, all the nerves and pitfalls of being the new kids at school, and Mxyzptlk wreaking havoc on their first day on the job. It’s not easy, and they’re going to have to learn to deal with all this teenage drama fast. From the get-go, this is a brilliant premise. The places you can go with two aliens dealing with teenage cliques, puberty, relationships, and all the other troubles of trying to fit in and gain a reputation when you can shape-shift and your home planet has mass orgies whenever there’s a thunderstorm. It’s just a perfect idea that Russell has all the comedic talent for, with the heart and charm as well. Playing off Zan and Jayna’s straight-faced personalities and their complete lack of understanding of human conventions goes against the tropes found in any classic teenage drama. It’s such a perfect comedic fit it’s almost crazy to think it’s never been done before. But its brilliance doesn’t just end with the Twins themselves. 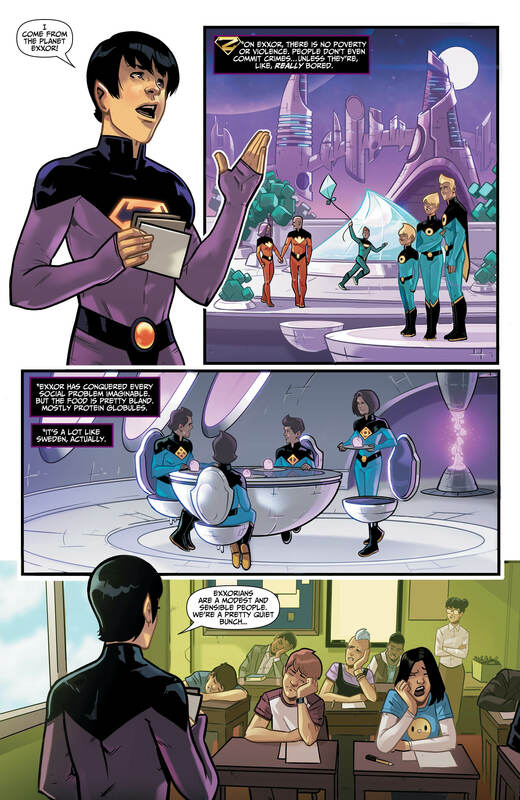 Russell uses the wider DC Universe to its fullest potential, and one of the best parts of this issue is the inclusion of the Justice League in the humble new Earth lives of the Wonder Twins. 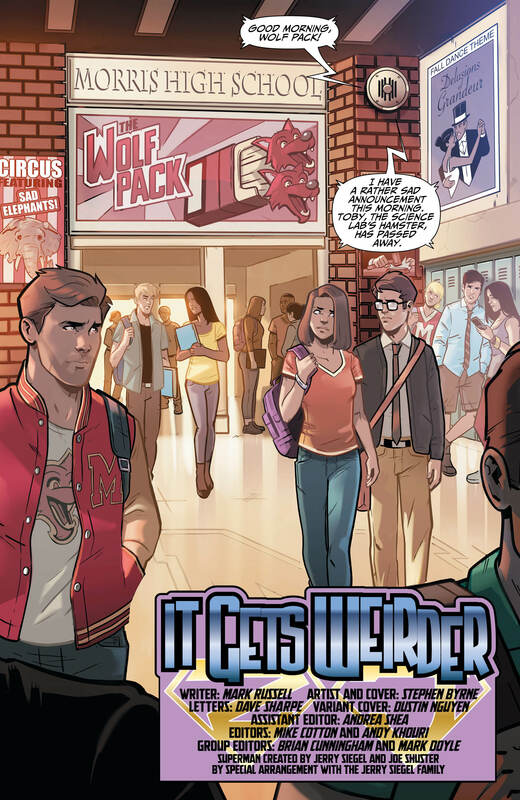 As the Twins deal with their high-school troubles, the Trinity end up becoming a great foil for their anxieties and questions, relaying their own high school experiences which leads to something both perfectly sweet and absolutely hilarious for the most famous of heroes. Add in fun with fifth dimension battles, plenty of opportunities to rib the conventions of comic book heroes, and some great homages (Hi Supercomputer! 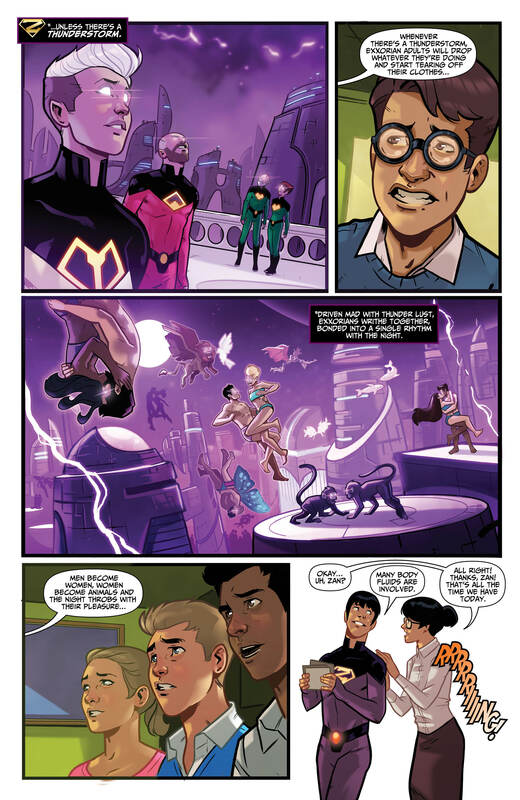 ), and Wonder Twins is right up there as one of most fun issues of a superhero comics of the past few years. 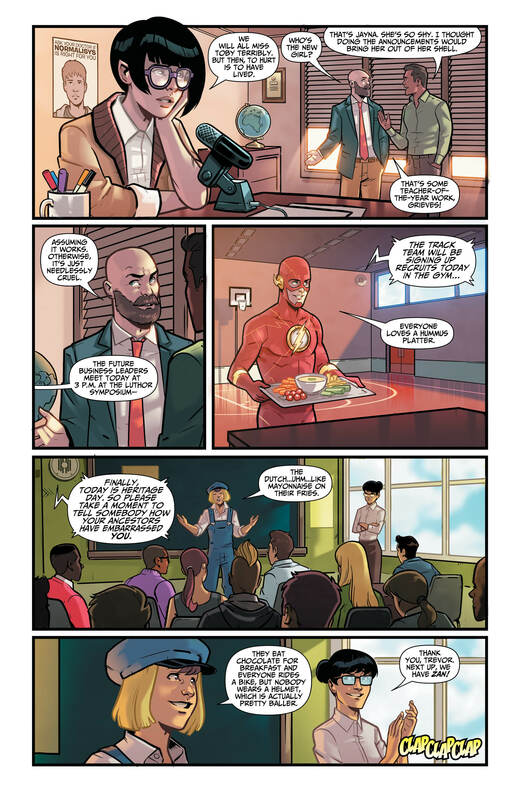 And of course, Stephen Byrne is just the best. Considered a relatively new face to the comic scene, Byrne’s work is superb. A master of character, physicality, energy, emotion and facial work, his cartooning is out of this world, and fits perfectly with the ins and outs of high school and fashion – not to mention fifth-dimension powers flying across the page. His own colouring is also perfectly mastered to bolster the vibrancy of his work to the nth degree, particularly during the scenes depicting the Twins’ home planet of Exxor in all its purple cosmic glory. He also manages to throw in some great background gags, the heart of any good comic comedy, not to mention and the fact you can’t help but love the way he draws Superman’s cheeky expression. It’s just so glorious. I’ll say it again, this is up there as one of the most fun issues of superhero comics released in years.